Born and bred on the Gold Coast, Wayne 'Rabbit' Bartholomew was instrumental in pioneering surfing, helping establish the world tour in the mid 1970's. Renowned as a master of the tube and with an almost cavalier approach to big waves, Wayne took out the 1978 world professional title. He was rated in the top five in the world for eight consecutive seasons, winning events all over the world. Rabbit remains revered as one of surfing''s fiercest competitors and greatest strategists - as well as one of its most flamboyant characters. After retiring from the professional circuit in the late 1980's, Wayne dedicated himself to furthering the development of surfing. 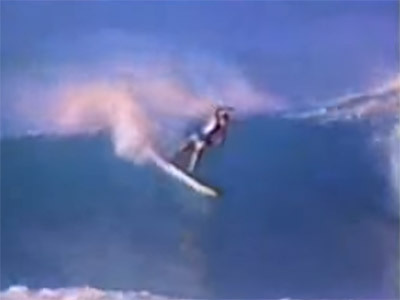 He established the Wayne 'Rabbit' Bartholomew Surfing Academy and with good friends Peter and Lorraine Bryant set up the Rabbit Circuit, a mini tour which helped fill the void following the collapse of the Australian Professional Surfing Association Pro-Am series. The circuit became a forerunner to today's Australian Championship Circuit, a stepping stone to the world tour for the surfing champs of the future. In 1993, Wayne became national coaching director for Surfing Australia, the sports national governing body. With the title came the responsibility for the then brand new Australian Championship Circuit - liaising with the Association of Surfing Professionals (ASP) to establish an Australian leg of the world tour. In March 1999, Rabbit was appointed to surfing's plum post - president and chief executive officer of the ASP - overseeing the multi-million dollar world tour. Rabbit negotiated the relocation of the ASP head office from California to Coolangatta, further reinforcing the Gold Coast's reputation as a world surfing capital. Rabbit remains an avid surfer and in October 1999, proved he is as talented and competitive as ever by winning the ASP World Masters title in France. He remains a strong grassroots connection to the sport through his role as president of his beloved Snapper Rocks Surfriders, Australia's most successful boardriding club.